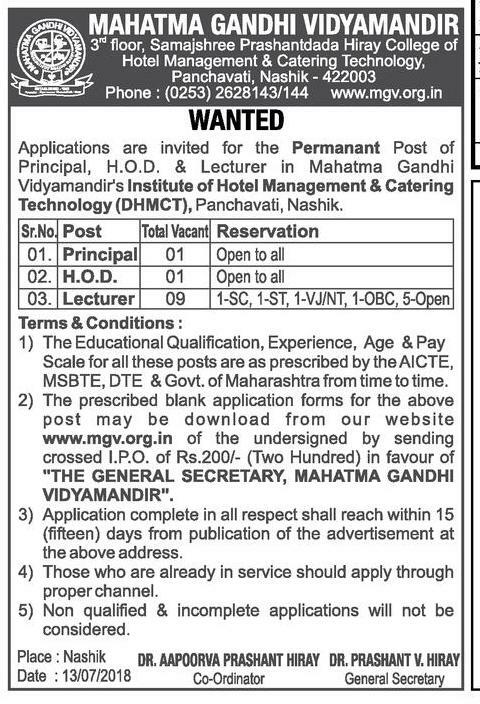 MGV Nashik (Mahatma Gandhi Vidyamandir), Nashik Published Job Notification for 11 Lecturer – Principal & More Posts. Candidates who wish to apply must look at MGV Nashik Lecturer – Principal & More Recruitment 2018. Eligible candidates can apply Offline before 28-07-2018. Interested & Eligible candidates can send their application along with all the necessary documents and testimonials to Gn. Secretary, Mahatma Gandhi Vidyamandir, 6th Floor, K.B.H. Dental College & Hospital Building, Mumbai-Agra Road, Panchavati, Nashik-422 003. Starting Date, Last Date to Apply Offline at Mahatma Gandhi Vidyamandir which candidates should be remembers as follows. Start Date to Apply Offline: 13-07-2018. Last Date to Apply Offline: 28-07-2018.